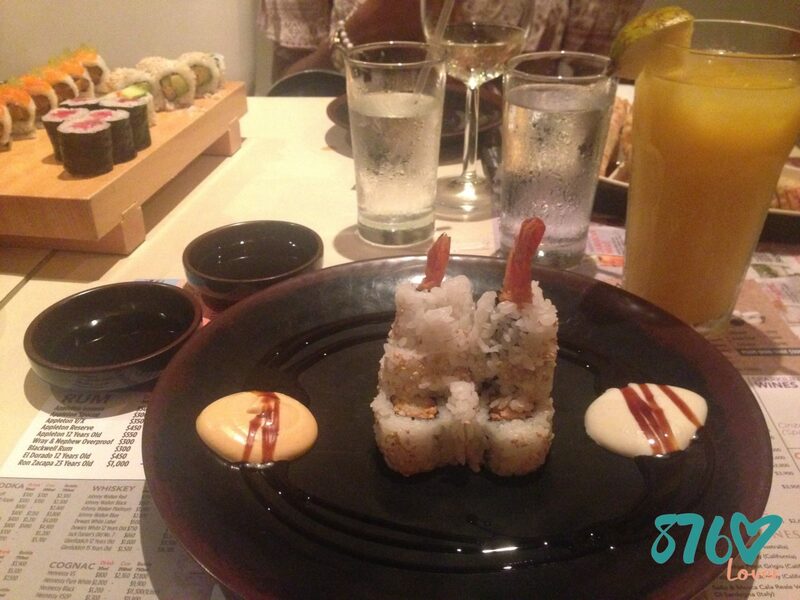 Last year I had the pleasure of having dinner at AnneX East Japanese, and lunch at SORA Japanese Sky Cuisine. The dinner at East Jap. is what lead me to try food from Sora, I had a hunger for sushi; both times were with my best friend, Gabby. Before dinner at East Jap. I’ve had cooked rolls once in my life, years ago, and I’m actually glad to have aroused that craving. The experiences left a great taste in my mouth, but I wanted to compare them for you. The cooked roll sushi war! We went to AnneX East Japanese for a special occasion, it was Gabby’s birthday celebration. We had a group of 10 by the end of the night but Gabby and I arrived early together; so, while we waited for the rest of the group we ordered Miso Soup as an appetizer. I didn’t like the soup, when I got it, it was barely warm and by the time I was halfway through it was cold. I was really upset about that because I was hungry and wanted the hot soup to soothe my tummy. Other than it being cold, it tasted alright but it wasn’t my kind of flavour. Now, I’m new to sushi… and a picky eater, so, I ordered a Shrimp Tempura Roll. It’s a simple roll, can’t go wrong with fried shrimp; the roll was cut into 8 pieces and stacked in the center of the plate with nicely placed garnish around the perimeter. The roll was delicious! The shrimp in the crispy tempura was cooked perfectly. My fave dipping sauce was the spicy mayo, it gave a slight pop of flavour to the roll; the soy sauce didn’t enhance the flavour of the roll in my opinion. My only issue with my roll was that it seemed to finish too quickly. Other points to note, I had to taste what Gabby had as well; I sampled the California Roll, which was good. I liked the combination of crab, cream cheese and avocado, though the avocado was barely noticeable. I also had a piece of her Crab Stick, which is crab meat and cream cheese enclosed in a fried tempura shell. This was really good but sometimes I’m not able to handle too much cheese at once and it was a bit overbearing. Which is great news for cheese lovers. 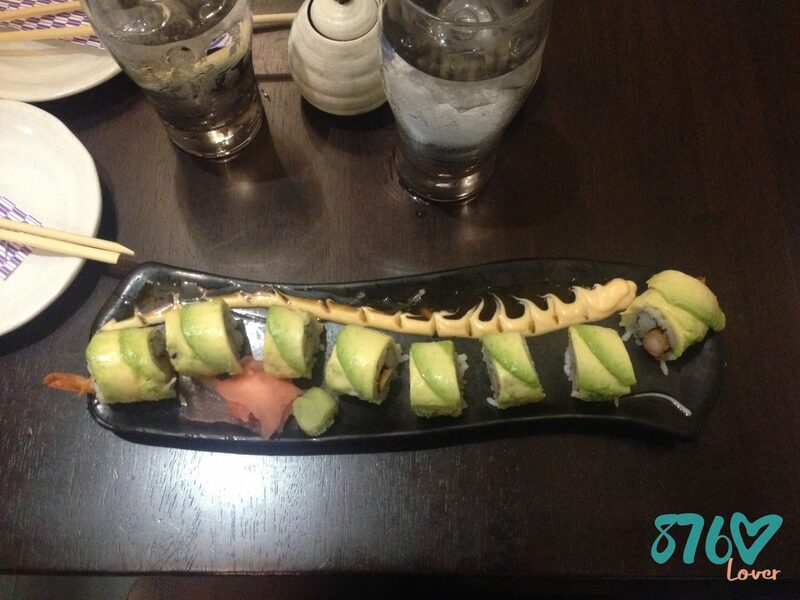 The Dragon Roll had 8 pieces with fried shrimp topped with avocado, and served with spicy mayo and eel sauce. As you may or may not have noticed, the small difference with my Dragon Roll and Shrimp Tempura Roll were the lack of tempura in one, and avocado in the other. This roll tasted great, the contrasting texture of the avocado against the fried shrimp was delightful. I’m not sure of the specific taste of the eel sauce because the spicy mayo overpowered it, which I didn’t mind (I love spicy mayo). Out of the rolls Gabby ordered, I only tasted the Char Shu, which I really enjoyed. The Salmon Tempura had salmon, cream cheese and deep fried crab; while the Char Shu had lettuce, tempura crunch, scallion, and roast pork inside and on top. The pork was cooked so well, and I’m not a big fan of pork but it was really good. Cue the drum roll… But first, let’s see the pros and the cons. On the pros list: both rolls I had were delicious and the service was quick for both restaurants. The only con I have is for AnneX East Japanese, whose waiter seemed to want to go home, the energy he gave off wasn’t very pleasant… maybe that was an off day. Another downside for them is that they are a bit more expensive than SORA Japanese Sky Cuisine. You know I’m on that university student budget, so on that basis, I’ll pick SORA Japanese Sky Cuisine as my cooked roll champion. I’ll be back there soon. AnneX East Japanese is located at 71 Lady Musgrave Road, and SORA Japanese Sky Cuisine is located at 9-11 Phoenix Avenue.